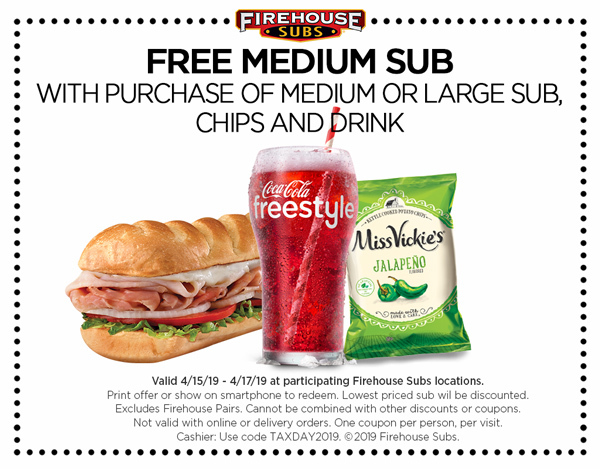 Firehouse Subs has your back this Tax Day with a FREE Medium Sub! All you have to do is purchase an additional large or medium sub, chips, and a drink. Just present this coupon to your cashier and get the deal. Firehouse Subs are great anytime, but especially when you can take advantage of a Buy One Get One FREE deal. Here’s your chance to treat a friend for free or just grab an extra sub for yourself. If you can’t make it on Tax Day, no worries. This promotion is available for THREE full days, lunch and dinner! Offer valid April 15-16-17, 2019 at participating locations. Not valid in conjunction with any other coupon or special promotional offer. Most Firehouse Subs restaurants will be closed Easter Sunday, April 21.